Nai Harn Beach is located in one of the most beautiful bays in Phuket, just to the south of Kata Noi and north of Promthep Cape. The area around Nai Harn provides a quiet secluded spot on the southern tip of Phuket, where you can enjoy a relaxing vacation with family or friends. The beach stretches for almost a kilometre, surrounded by a headland to the north and a smaller headland to the south. At the southern end of the beach there is a salt water lagoon that empties and fills with the tide. On the hill at the southern headland you will see the Windmill viewpoint, this is a great vantage point to take in the views of Nai Harn and Yanui beaches. During the high season from November to May, Nai Harn bay is a favorite spot to anchor yachts, as this area is protected from the winds and has calm seas. Many locals and expats choose Nai Harn beach for swimming because of the ideal conditions, as with most beaches it can get busy during the high season. Nai Harn is among one of the best swimming beaches in Phuket, and is one of the best spots for surfing during the monsoon season from April to November. 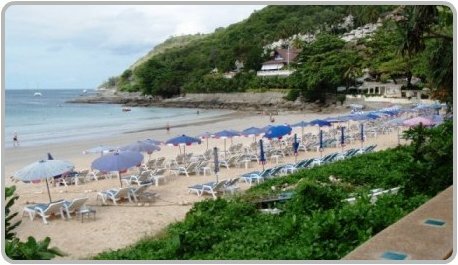 The area of beach in front of the Nai Harn resort is one of the best spots for snorkelling, equipment can be hired from vendors on the beach. During the high season kayaking is also available. There are ample sunbeds and umbrellas for rent along the beach. From May to October the area around the northern end of the beach can be a great spot for body boarding if the waves aren't to big, while the southern end of the beach is the best spot for surfing. There are not many jet skis vendors that work the beach and no banana boats rides. Caution: From May to October, Nai Harn beach, like many popular west coast beaches in Phuket can be too dangerous to go swimming. If you see a Red Flag on the beach for your own safety do not go in the water. 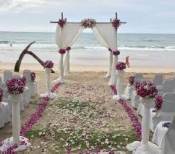 There is really only two resorts that are located close to Nai Harn Beach. 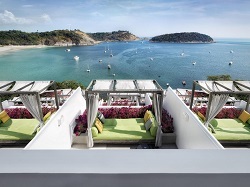 The Nai Harn Resort is situated on the beachfront at Nai Harn, nestled into the northern headland. All rooms feature large sea-facing private balconies that offer panoramic views of Nai Harn Bay. All Seasons Nai Harn Hotel formerly known as the Sabana Resort is ideal for a relaxing holiday with the kids. The resort is located just a stones throw away from the powdery white sands and clear blue waters of Nai Harn beach. Despite having a rather limited selection of accommodation directly on Nai Harn beach, there is a good range of places to stay from budget bungalows and villas to 5 Star Resorts located close by. 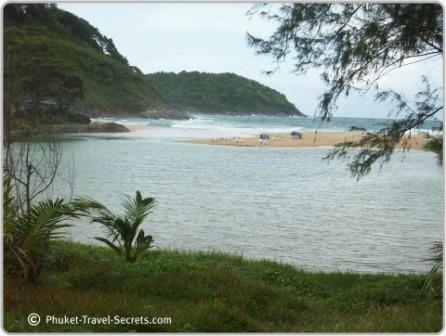 There are lots of interesting things to see at Nai Harn, just behind the beach is an inland lake. Nai Harn lake is over 1km long with an island in the middle that is joined by a causeway. The area around the lake is popular with cyclists and joggers and the lake is used for organized water sport events such as dragon boat racing. A five minute drive south of Nai Harn will bring you to Promthep Cape one of the best sunset viewpoints in Phuket, this the perfect spot to watch the sunset, in fact the sunsets from here are so good it's also known as Sunset Cape. Lying between the beach and Nai Harn lake is the Samnak Song Nai Harn Buddhist Monastery. The Monastery owns a lot of the land in this area, restricting commercial development along the beachfront and has helped preserve much of the area of its original charm. This could be the reason why the beach is generally less crowded than other areas on the southern part of the island. Take a drive through the car park of the Nai Harn Resort and follow the road for about kilometre, you will find a beautiful little beach called Ao Sane. 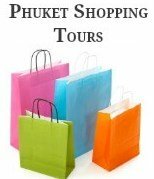 Nai Harn is not known as the best shopping destination in Phuket. 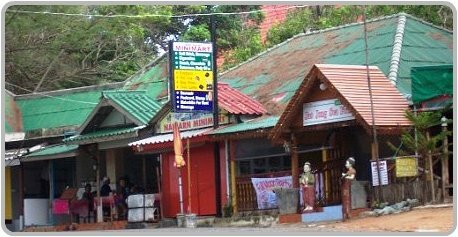 Although just opposite the car park near the beach you will find a few small shops, including a mini mart and pharmacy, a tailors, bike-hire, massage and beauty treatments and a shop that can arrange boat trips and day trips. A drive along the lake, takes you into Nai Harn village, where you will find a larger selection of shops, including a small supermarket, a great brunch café, art gallery, craft store, bars and restaurants. There are a few restaurants located under the trees behind the beach that serve good Thai and seafood meals. There is also plenty of food vendors around the entrance to the beach. Not far away from the beach is Nai Harn village where you will find plenty of places to eat. If your looking for somewhere a little more up market head to Rock Salt at the Nai Harn resort a popular beachside restaurant with an idyllic position overlooking Nai Harn Bay. The Rum Jungle Cafe is a small restaurant offering Mediterranean foods, with great daily specials. The nightlife at Nai Harn is fairly quiet and spread out. A great place to relax with a nice cocktail or cold beer and watch the sunset is at The Reggae Bar, located next to Nai Harn Lake. Other bars that we found near the 7- Eleven are the Muay Thai Bar, Pukky’s Bar and Rum Jungle.